Once upon a time, the artists tasked with illustrating medieval manuscripts used cerumen (more commonly known as earwax) in their paints (source). While that was a creative use of a substance many people consider an embarrassing nuisance, earwax does have an important purpose. Believe it or not, the primary function of cerumen is to protect the health of the ear. Cerumen is misunderstood. Like mucus, it’s a substance produced by the human body that many people consider gross despite the fact that it plays an important role in defending and maintaining the body’s health. Where Does Cerumen Come From? Only part of the ear is readily visible. The external auditory canal, which is sometimes called the outer ear canal, connects the visible outer part of the ear with the ear drum. Contaminants like dirt and dust can sometimes make their way inside this space. Dead skin cells also accumulate as the skin that lines the ear canal continually renews itself. To remove this clutter, the sebaceous and ceruminous glands inside the ear canal release lipids and other secretions that combine to form the waxy substance referred to as cerumen. What Is the Function of Cerumen? Why does the body produce cerumen? There are three excellent reasons. For starters, cerumen lubricates the skin of the outer ear canal. This prevents itchiness and reduces the incidence of tiny cracks that could trap bacteria and allow an infection to flourish. Cerumen also helps to maintain the acidic environment of the ear canal. This acidity kills fungi and bacteria, further shielding the ear from infection. Finally, cerumen helps to keep the ear canal clean. Movements of the jaw propel earwax along the ear canal. As it moves from the ear’s interior toward the outer ear, the earwax sweeps up dead skin cells and tiny contaminants (like dirt, dust, and dead bacteria) and carries them out of the ear canal. Age. Older people, especially older men, often produce a lot of earwax. This excessive production can create troublesome buildup. Physical structures. Some people have ear canals that are unusually shaped. Narrow spots or kinks can make it more difficult for earwax to be expelled. Use of in-ear headphones, ear plugs, or hearing aids. Frequently placing items in the ear can cause cerumen to build up and harden. Attempts to remove earwax improperly. 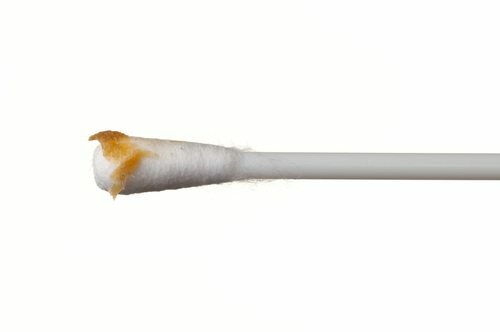 Many people attempt to clean out their ears with utensils like cotton swabs and hair pins. This type of approach is typically ineffective and potentially very dangerous. In addition to causing impacted earwax by tamping down the cerumen, it can scratch the skin of the ear canal, triggering pain and infection. Sticking an item too far inside the ear can also damage the ear drum. Symptoms of impacted earwax include discharge from the ear, aching, ringing in the ear, dizziness, coughing, a feeling of fullness in the ear, and decreased hearing. While it might be tempting to try and handle the problem at home by cleaning your ear with a cotton swab or consulting Google for DIY remedies, this can be dangerous. The ear canal and eardrum are delicate structures that can be easily damaged by amateur attempts to dig out impacted earwax. This is especially true for individuals who have a weakened immune system, are diabetic, have a hole in their ear drum, struggle with skin issues that affect the ear canal, or who have had ear surgery. So if you are experiencing the symptoms listed above, make an appointment with your doctor or audiologist as soon as possible. Contact Apex Audiology today if you live near Colorado Springs, Limon, or Pueblo, Colorado. We have the experience and equipment needed to safely and effectively remove troublesome earwax, and we can also help you better understand the function of cerumen. Give us a call today at 719-247-9000 or send us a message online.